Yesterday Flame was perched above one of the ladders when I noticed feathers drifting from her and attaching themselves to the weld mesh or landing in a heap below her. 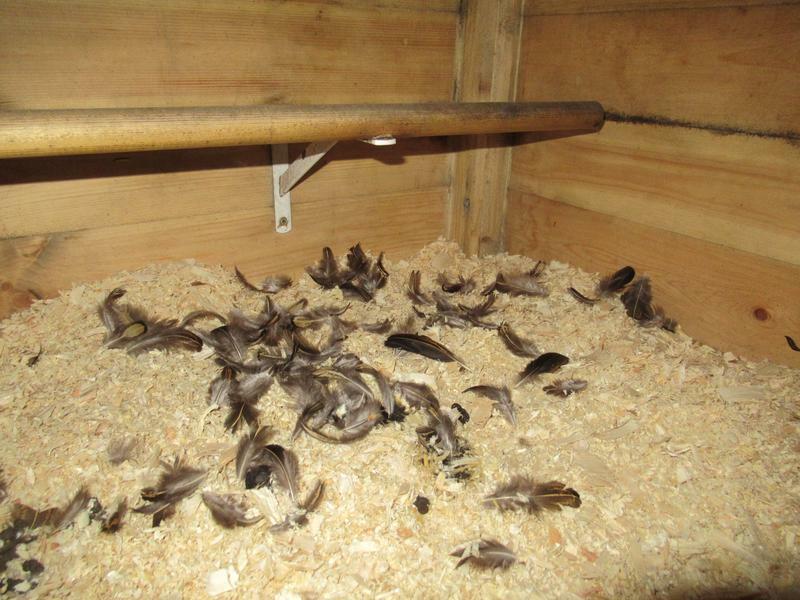 This morning when I opened the chicken shed there was a mass of feathers below the spot Flame had perched. I am amazed that Flame looks so good when there have been so many feathers all around the run today. She must have been getting her new feathers in underneath already. Her long tail has gone but rather than no tail she has a shorter tail already grown in. It is just over a week since her broody day and her last egg. Now that she is in full moult I realise that she isn’t a first year girl but is just a very good layer. I am going to record her as two years old. 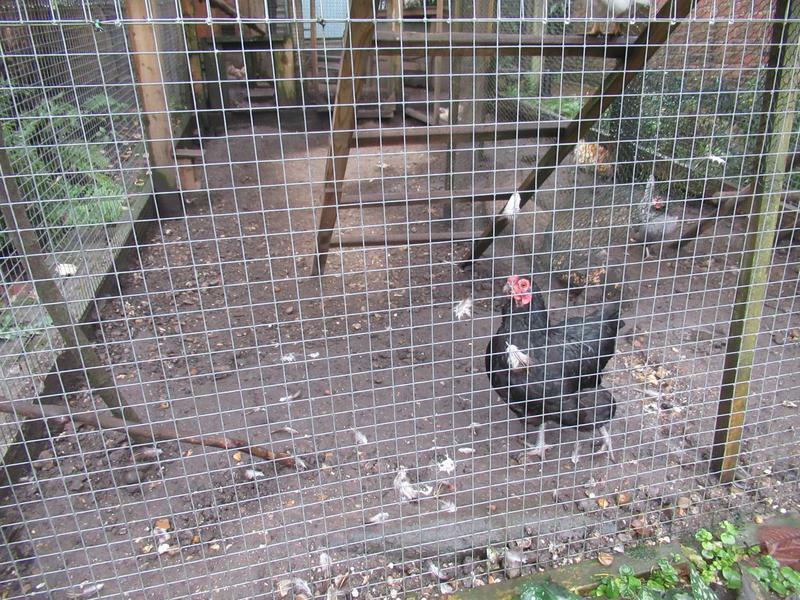 Ebony has dropped a few long feathers overnight but laid today. She has slowed down and has laid three eggs in the last week. I am thinking that she will probably soon stop laying too. In comparison to how good Flame looks Dandelion looks really shabby. 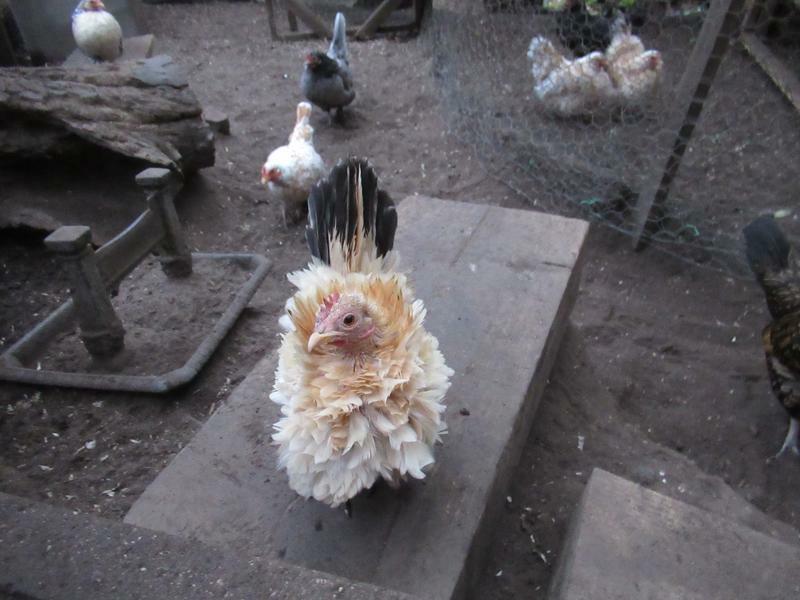 I am hopeful that she will get her feathers through before the really cold weather. In the comments on my last post David said that he had the same thing at bedtime with the lower ranking girls being blocked from the pop hole by the higher ranking girls. He got round this by wedging the door open to allow his bottom girl to get in. We are going to be out on Sunday afternoon as we have our Christmas get together with friends. Usually we meet up one evening but this year it was decided to meet up for a late Sunday lunch instead. We are meeting at a near by pub at 3.30pm for drinks and are eating at 4.oopm. This cuts across the time that the girls go in (the pop hole is currently closing at 4.oopm). I am thinking that it may be about 7.00pm before we get home. It is forecast to remain mild so I am not worried about it being cold but just a bit concerned that the amigos will be shut out in the dark when they are used to me letting them into the shed as soon as the pop hole closes. So I decided to try David’s idea of wedging the door open. If I can get the amigos used to this over the next few nights maybe they will get themselves in on Sunday and I can close the shed door when we get home. 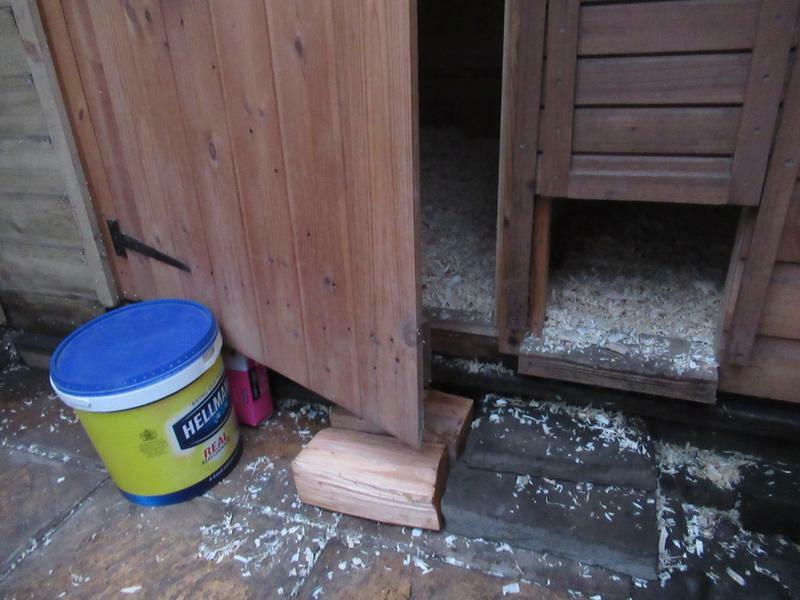 I wedged the shed door open a bit with a box of disposable gloves inside and the bucket that contains the pellets outside. I then borrowed a couple of logs to form a step. I intended to go up before the pop hole closed and try to guide the amigos through the door. I miss timed it and when I went up the pop hole had already closed. Three of the amigos were still outside so it had partially worked. I shepherded the remaining three through the gap in the doorway so that perhaps they will know where to go tomorrow. 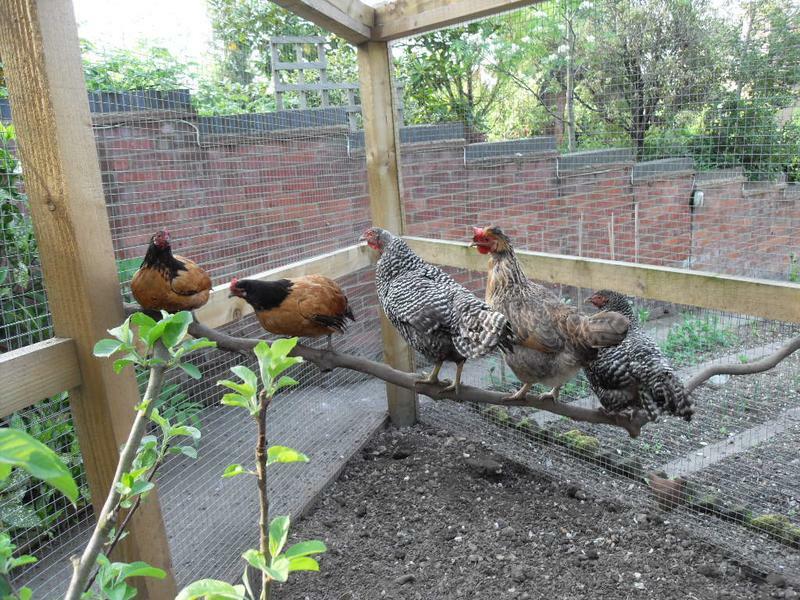 I then helped them to get perched and closed the door but left the logs in place so that they can get used to them. I have a couple more evenings to try to get them used to this. Tomorrow I will try to get the timing better. As always these things are a work in progress. It will be interesting to see how tomorrow works out. 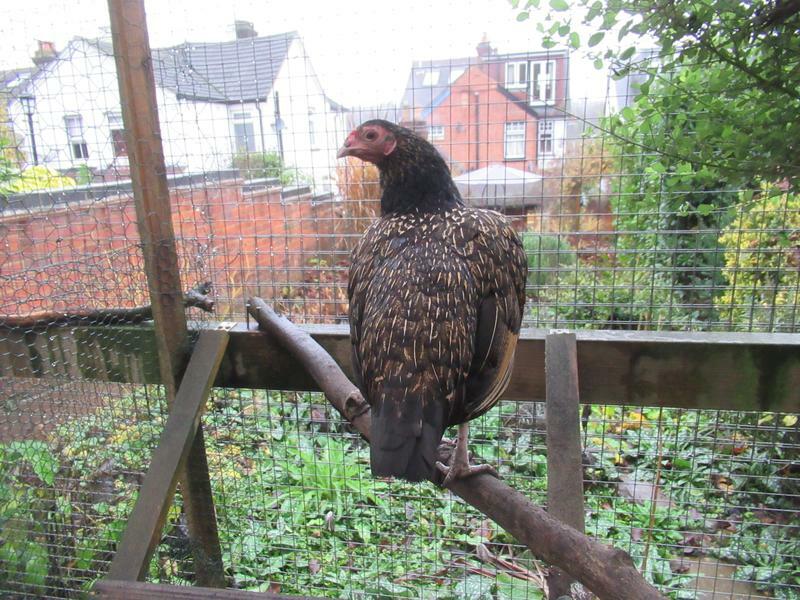 Lovely picture of Flame, even without her tail feather. Hope it all work out by Sunday. I am amazed that with the amount of feathers I am picking up Flame isn’t bare! She looks great, as you say, even with a shorter tail feather. I am just about to put tonight’s post out so watch this space.